I'm becoming quite the educated Archie. That is two Saturdays and two Museums. Last week it was Glasgow and the Kelvingrove Museum. Today, 9th June, the Chambers Street Museum in Edinburgh. 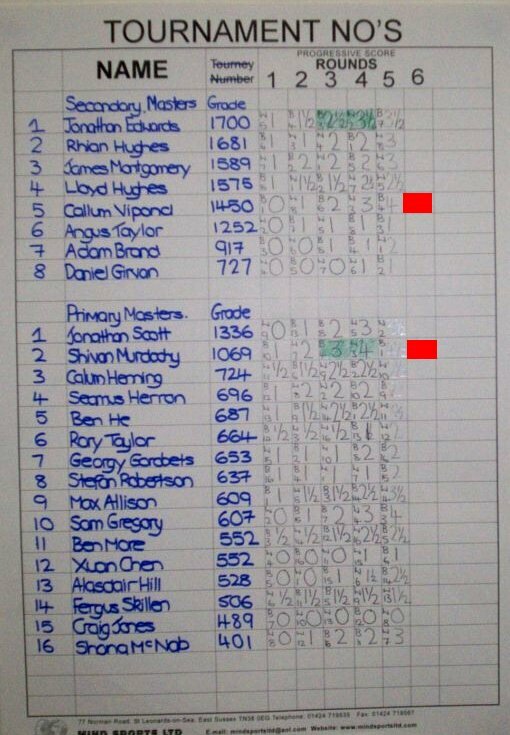 I was there to watch the Lothian Junior Masters. participants and former MSP Robin Harper who presented the prizes. still maintained his interest in Scottish Junior Chess. Here is the cross table of both events. the lower is the Primary section. a red square the winners of each section. Calum Vipond getting his trophy. Shirvan Murdodry deep in thought (he's Black). that they had presented the Primary kids the Secondary school trophies. "Don't let Geoff Chandler find out." whispered Jeremy Hughes. "He will make it banner headlines on Chandler Cornered." Jeremy Hughes Messes Up Prize Giving. B.More - F.Skilien This is a good game. piece and then miss a one move threat and get checkmated. concentration and knows when to give one of the pieces back to finish the job. In this position it is Black to play. with a gain of tempo whilst still covering h2 and rid himself of the d-pawn. 23...Bb5! A wonderful piece of chess, he invites the Rook fork. 24.Rxd5 c6 25.Rxg5 Bf4 hitting the Rook and mate is coming on d1. watching two submarines chasing down a battle cruiser. I'm trying to recall some of the silliest things I have done in my lifetime. around the countryside till they got it back to me the following day. I went to take £10.00 out of a cashline machine but never took the money. There was a wee homeless person sitting under the machine. I went back 10 minutes later but he was gone. (so was the tenner). I was playing chess in Motherwell but took the train to Newcastle instead. recalls the day we set off to play in allegro and ended up in a different country). I've been to work on Thursday dressed in jeans thinking it was Friday. was a Friday. Once I turned up for work when I had a day off. But I have never been beaten by my younger sister at chess in 8 moves. Move 7 is a typical Miss Hughes move. Sly, sleekit and sneaky. The decoy is the attack on c7 which Black fell for and covered. The real target for the Knight was the square d6 and the King. There was some giant killing going on. Adam Brand (917) beat top seed Jonathan Edwards (1700). some fine attacking sacrificial play, (though analysis proves it to be unsound). Jonathan took it in the right spirit. Here he is pointing in disbelief at the scoreboard. Bertie Burns turned up. Which is not too strange, he works at the museum. of various tournaments. Adam has a 100% score against Bertie. Here are the two of them. for the event and the playing rooms were free of charge! So that was that, A good day. prize winners in the Primary Tournament) is a spitting image of one of my heroes. Alfred E. Nueman, the main character in MAD magazine.